You've been in an accident and it's the other guy's fault. No one is hurt but now you've got to file an insurance claim and get the damage repaired. It sounds simple, but sometimes it isn't. You want your car returned to as close as possible to the condition it was in before the accident. The insurance company paying for the repair has a strong interest in how much it's going to cost to do that. The fact is, insurance companies and auto repair shops often argue over what is necessary to repair the vehicle and the consumer can get caught in the middle. By law, the consumer filing the claim has the right to choose the repair shop, but it's very possible the insurance carrier will reject the estimate, especially if it is not one of its "preferred" repair shops. We got a revealing glimpse of this growing conflict when we researched the issue and came across an article on the website for Mark's Body Shop in Baltimore, with the not-too-subtle title "5 lies insurance companies tell you after an accident." In the article, Mark claims insurance companies have pressured his shop in the past to use non-OEM, reconditioned and salvage parts. And the issue isn't just limited to Maryland. “Our Consumer Protection Division receives complaints from consumers about disputes between insurance companies and collision repair shops,” said Mississippi Attorney General Jim Hood. He notes the issue has increased in recent years because of changes in the way cars are made. The lighter, synthetic materials used in the body are much more expensive to repair, in part because of the training required to do the work. “In order to place a vehicle back in its pre-accident condition, some body shops have to buy expensive machines or tools and have their technicians trained and certified on the repair procedures for certain makes of vehicles," Hood said. 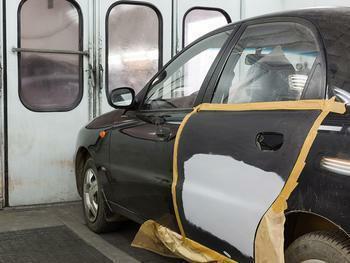 "Some collision repair shops which do not obtain these certifications and tools, may offer to do a repair cheaper. The goal of the insurance companies is to keep repair prices as low as possible. Therein lies the conflict for consumers to navigate." The conflict poses a problem for the insurance industry as well. Thomas Hambrick, assistant vice president of media and public relations at The Hartford, told USA Today there could be an initial disagreement with the repair shop, but the two sides usually reach an agreement on the price and the repairs. In response to the conflict, Hood's office has published a "Consumer Guide to Insurance and Auto Body Repair," which lays out consumers' rights when their vehicle is being repaired and paid for by an insurance claim. The guide points out that insurance companies are only required to pay the lowest estimate for "properly repairing" the vehicle. But that "properly repaired" is key. Consumers should discuss with the person doing the repair, how it will be done, and whether OEM -- original equipment manufacturer -- parts are being used. While the insurance company will suggest shops to make the repair, the decision is ultimately yours. In making it, ask the shop manager about the technology and training the shop uses. Checking out online reviews is a good idea as well.